It is time for ISTE10 in Denver. Educators from around the world are gathering to discuss and plan the future of edtech, play (some), but most of all, meet people. Conferences are great ways to make lasting connections with people...to grow your personal learning network. Then today I got to attend some really amazing sessions at EduBloggerCon and got to shake the hands of some of the educators I admire most. But that got me thinking. While we know each other, we don't know each other. There are some on Twitter that I follow because they are interesting or have good resources. There are others that I follow because I like their conversation. But I might not ever have engaged with them. Or if I have it has been very little. That got me even more thinking about relationships. Specifically, the relationships we have with the people online. What made the friends in Estes Park different from the ones at EduBloggerCon? And I really do consider everyone I follow and interact with my friends. We are more than colleagues I think. Our relationships are more than that. There was a very interesting post earlier this week from Scott McLeod about how you never really know that person sitting next to you at a conference. While you might think someone is a rockstar they might really beat their kids or drink too much. Yeah, you might not really know that person sitting next to you. But. Isn't there some level of trust that we place in the people we meet and get to "know" through social media? Is that a good thing or a bad thing? I know there are certain people in my PLN that if I need something, even if it is personal and in no way educational, I can call upon. ISTE10 is right around the corner. Many participants of #edchat had said they will be in Denver. 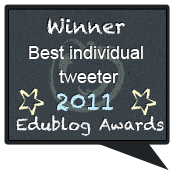 Why not have an #edchat Tweetup/Informational Session and a live #edchat? Myself (Co-Creator), Kyle Pace (Moderator), and Mary Beth (Moderator) will be hosting a Live #Edchat on Tuesday June 29th in the Social Butterfly Lounge in the Denver Convention Center. We will starting at 4pm (Denver Time) so that you can come and meet other Edchaters. Kyle, Mary Beth and I will also be demonstrating how we use Edchat and how we keep up. Then at 5pm (Remember, Denver Time) we will all grab our laptops, phones, iPads (if we are lucky) and participate in the weekly Edchat. If you have participated in #edchat before and you will be in Denver, this is a great chance to stop by and meet some people you have been chatting with. 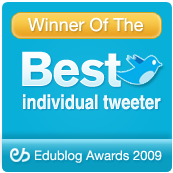 If you haven't participated before this is a great time to find out why #edchat is one of the only Award Winning Educational Chats on Twitter. And I hope everyone brings a friend! Thanks to ISTE especially Dawn Shrum and Katie Stansberry. They are providing the space along with tons of equipment and you will see this impromptu event promoted in the Daily Conference Newspaper thanks to them. So when you see them make sure you thank them for all the help getting this organized! So stop on by the Social Butterfly Lounge on Tuesday between 4-6pm (MST). See you there! Last night over 150 people joined us in Elluminate to talk to Howard Rheingold on how do we get kids thinking critically about the information we find online and off. It was a great discussion with tons of information. First here is the link to the archive of the Elluminate session. It lasted a little over and hour and well worth the time to go back and really listen to what Howard has to say. Next is the wiki that Howard has created to collect resources related to critical thinking and internet literacies. There is all ready tons of stuff there but Howard encourages us to add more. Howard had a great slidedeck of screenshots of different websites used in teaching critical thinking with the information we find on the internet. Here are the links to all the sites in the deck. I also encourage everyone to check out Howard's article and video on what Hemingway called "crap detection." These are great resources to use when teaching older kids how to really evaluated what information they are coming across when doing research online. The Microsoft search engine, Bing, has teamed up with Howard to create a curriculum that you can use with kids to help teach evaluation of information. It is a great eBook and best of all it is free! Thanks to Howard and Betsy at Bing for joining us in our Special Conversation! How do you teach kids to think critically? What resources do you use? How can we get kids to really evaluate the information they come across on the web. Leave your ideas in the comments below! On Wednesday, June 16, at 5pm PDT/ 8pm EST (Convert To Your Local Time Here), members of the EDU PLN Ning and participants of #Edchat will have the unique opportunity to join Howard Rheingold in a conversation about teaching Critical Thinking. Howard Rheingold has graciously agreed to take questions from members of the Ning. He wants you to share your examples and suggestions on how to teach critical thinking. 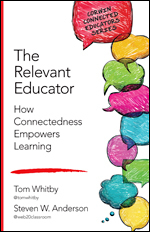 Tom, Shelly, and I will choose a handful of questions that we will then ask to Howard during a 1 hour Elluminate session. You can leave your questions below or, better yet, if you are a member of the EDU PLN Ning (and I hope you are) you can visit the forum there and post your question. **When writing your question please include your first and last name, Twitter name and location. **We will use the hashtag #HRChat for the discussion! 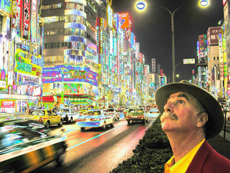 Howard Rheingold is the author of Tools for Thought, The Virtual Community and Smart Mobs. He was the editor of Whole Earth Review, The Millennium Whole Earth Catalog, founding executive editor of Hotwired, founder of Electric Minds, a Non-resident Fellow at the Annenberg Center for Communication, (USC, 2007), and a Visiting Professor at De Montfort University in the UK. He has taught Participatory Media and Collective Action (UC Berkeley, SIMS, Fall 2005, 2006, 2007), Virtual Community/Social Media (Stanford, Fall 2007, 2008; UC Berkeley, Spring 2008, 2009), Toward a Literacy of Cooperation (Stanford, Winter, 2005), and Digital Journalism (Stanford University Winter, 2005, 2006, 2007, 2008). His current projects include the Social Media Classroom, The Cooperation Project, Participatory Media Literacy, HASTAC/MacArthur Foundation grantee, and the 21st Century Literacies videos. Watch the 6 minute video interview. We would like to thank Betsy Aoki, Microsoft's "Blog Queen" for helping us set-up this discussion with Howard. She was recently featured by ZDNet as one of Microsoft’s Women to Watch, and responsible for launching Microsoft's corporate blogging efforts at blogs.msdn.com and blogs.technet.com. Since then, she has worked to deliver a few more community projects for Microsoft -- Live QnA and the Xbox Live Indie Games platform. She tweets from @bing and creates community outreach projects for Bing. I am sure I missed some. If I did add them to the comments and remember to tag them with #sumread10! Teachers ask me all the time for technology ideas on a wide variety of subject areas. Some days I can get 30 questions from 30 different teachers but they all might be asking the same sort of question. One day it might be questions on how to use Google Earth and the next it might be all Smartboard questions. It sure would be helpful to have list of easy ways that these tools can be used in the classroom. Mark Warner has created a site that does just that. (The idea came from another teacher named Tom Barrett. He collaborated with over 100 teachers to get ideas on all these topics.) Using some Google Presentations teachers can see how various technologies can be used in the classroom. He has included presentations on a wide range of topics including Interactive Whiteboards, Netbooks, Twitter, Google Earth, Google Docs, Webcams, and more. There is also some really good information on curriculum topics like math, science, writing, art and music. Each presentation gives teachers several ideas on ways to use the specific technology in their classroom or ways technology can support the specific content area. The presentations are short and offer some really good ideas. I guarantee that you will learn at least one new way to do something in your classroom, if not more. So head over to The Ideas To Inspire Website and learn how other educators are using these tools in their classroom. It seems like each day that we get closer to students and teachers being out of school for the summer I see a new book recommendation that someone posts on Twitter for others to check out over the summer. Now, I spend lots of time checking out Twitter but I know I miss a lot of great reads that I really should see. So yesterday I created a simple hashtag to keep track of all the recommendations. If you are on Twitter it is simple. Tweet out the name and author of your book and tag it with #sumread10. It can be a great education book or just a great book you think others will enjoy. You can do a search for the hashtag and see all the great recommendations. Better yet, below I have put a live search gadget that shows all the recommendations. I will also be compiling the list over the weekend and posting it right back here. Not on Twitter? Thats cool! Just leave your recommendation in the comments so I can add it to the list. My district is changing website providers over the summer. In anticipation of the change our teachers have been learning how to move their content from their current page to their new one. For most this is just another task in an otherwise busy day. For some of our teachers it is one more stressful thing to do. You see, we just changed providers 4 years ago. There was a big transition with teachers learning how to customize their pages, adding in all the bells and whistles. Some had just now, after 4 years become comfortable and were designing great pages. Then we come in and change everything again. One of those teachers that was just feeling comfortable is at my school. She is a wonderful teacher with 20+ years of experience. But she will be the first teachers to tell you that her and technology, any kind of technology do not get along. Now, she will attend PD and and be polite and try but normally gets very frustrated and shuts down. That was the case with learning about the new webpage. During the initial session there was not a great deal of time to learn all the in's and out's of how to do everything. The teachers were just going to learn how to create a new page and how to copy the content from their old page to the new one. And again, for most it was no problem. But for my teacher it was a huge problem. She really needs things step by step by step and she was just not getting it. She became so frustrated she left saying she would not be doing a new webpage. I talked to her after a few days and told her what if I brought in someone to work 1-on-1 with her. Would that help? Would she be receptive to that? She doubted it and she doubted her use of technology at all in the classroom from that point forward. But I knew there was a chance. I didn't want this teacher to feel like she had failed. And, deep down, I felt like she didn't want to give up. My very good friend Melissa is our district expert in our new website so I asked her if she wouldn't mind coming out and just doing a follow-up session for my teachers. It wouldn't be required but we both would be there if anyone needed any extra help. She agreed, we settled on a date and we were on our way. When Melissa came out to my school my teacher wanted nothing to do with the follow-up. She had really decided she was not going to learn anything. But, she walked by the room and reluctantly went in. Unfortunately for me I could not be there with them because I had another meeting but later on in the afternoon the teacher came to thank me. And then the next words out of her mouth I will remember as long as I am alive. She said that was the best technology training she had ever had and if I needed an advocate for how easy this stuff can be she was it. And if I ever needed an example of someone who was so against tech but could change she was it. On #edchat this week the topic centered around what should be the required elements of professional development for teachers and how trainers could make PD more meaningful. It was a great discussion and I encourage you to check out the archive. There is something to take away from this whole experience that maybe those of us who are responsible for professional development. I have been thinking about it a lot lately and have come up with my 3 suggestions for improving the quality of professional development. K.I.S.S. Keep it simple..well you know the rest. Often, especially in technology professional development those that do the training try to cram in every little thing into a session. I can't tell you the number of sessions I have sat in on various products where the trainer tried to explain any and all details about some tool or program. Now, I love technology. I live, eat, and breathe this stuff. But most teachers are completely different. Most are content specialists. They know what they teach backwards and forwards but when it comes to learning technology they really have to take their time. And we try to pump too much information into their brains all at once the likelihood of them shutting down and not using what we are teaching is very high. If possible we have to focus on one thing at a time. I am always an advocate of looking at one thing for 6 months to a school year. We can really dive in, spend lots of time talking about the ins and outs of the tool or resource. Of course there might be people that don't need that much time but you probably know who that is by now anyway. But taking lots of time on very specific topics leads me to my next suggestion. Reflect. Reflect. Reflect. By taking it slow and spending lots of time on one specific tool or resource we provide times for all involved to do some reflection. As a trainer what I do is never perfect. There is always room for improvement. One of the tenets of instructional design is taking time to reflect on what works and what does not. By taking it slow we get the opportunity to take a step back every now and then and see what is going well. What is working? What isn't? What do we need to cover again? What would I do differently the next time? Is there someone who needs some extra help? I never would have been able to help my teacher with her webpage had it not been for the simple reflection I did after the first training. And the reflection is important for the teachers as well. They get to really think about how this new tool or learned skill fits in to their classroom and with their kids. They also need time to soak it all in. Even if what we think we are presenting is as easy as copying and pasting there has to be some time for reflection. And reflection leads to play. Play Everyone needs some time to let loose and play. The fact is, often, in PD there is not enough time for play. Time isn't taken for play. There is usually some time to mimic but not really play. Teachers who are learning new tech skills as part of PD desire more time to just get in and play. Not during the actual PD but afterwards. Teachers need to have time to go back to their classrooms and get their hands dirty. But they need that support of the trainer. We have to be available and offer follow-ups and 1-on-1's. We can't send our teachers back to the classroom with some new skill and not check on them or simply follow-up. Would we do that to our kids? Doubt it. Why do that with teachers. So the time to play leads to reflection. And we would have neither had we not taken it slow and kept it simple. There is no doubt that teachers need PD. And there is no doubt there is meaningless PD out there. But we can begin to make it better and have a greater impact on our teacher learning. What else would you suggest? Are you a teacher that has been in a bad PD? What was bad about it? What would you change? Are you a trainer? What do you think about my suggestions? What would you add or change. Leave some comments below. In terms of teaching, this can be the hardest time of year. Yeah, the beginning of the year can be tough. Even that middle between late January to March can be tougher. But if you ask the teachers in my building this time of year is brutal. Our state testing is over. We are in the midsts of re-testing students who didn't get it the first time. (And that is a whole other issue for another day.) Teachers regularly have to keep 1 or 2 groups of kids for 3-4 hours so there is absolute quiet in the building. Many teachers are asking each other what to do for that long. But for me, this was the best time of year. I could do whatever I wanted in my classroom. No curriculum. No requirements. No stress. All fun. This was the time of year I could really let loose and let kids explore whatever they wanted and learn whatever they wanted in my class. Of course, we had been doing this all year long but there were always the requirements of administrator walk-throughs, district testing, etc. But this time of year was different. It was like learning without consequences. A math teacher in my building came to me yesterday and was asking for ideas for her group of kids she would have for about 2 hours. She had an idea but wondered if there was a "tech" extension. She teaches 6th grade and likes having the kids reflect on their year. (She has each of her groups every year do some thing different.) She then takes the reflections from the previous year and gives them to the rising 6th graders on their first day of Middle School. The kids hear from other kids what being in middle school is really about. This year was no different. But she was stuck. She wanted the project to be fun and engaging but needed a hook for the students. Earlier that day I had come across this great blog post from Suzanne Whitlow on a Facebook Profile page. I had seen similar projects where students create pages for famous people, places, events, etc instead of doing boring reports. My teacher instantly jumped at the idea. She could take the template and have the kids make Fan pages for their favorite parts of 6th grade. The kids could do their reflections but present them in a way most kids understand. I peaked in while the kids were working. I nearly came unglued. What I was seeing was amazing! The kids were so excited. They were rapidly making color changes, adding text, and inserting pictures. They were talking to each other about the best and worst parts of the year, debating the best teacher in the school and warning the newcomers about teachers to avoid. The teacher gave me all the files that the students did so I can put them on our website. But I wanted to show a few here as an example of how something so simple can be so powerful. Very cool stuff. I can't wait to share all of these with our rising 6th graders in August. What kinds of cool projects have you done at the end of the school? Or how have kids amazed you recently? Leave some comments below.